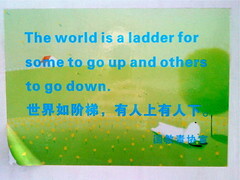 This poster is on the wall in the stairwell at Wuhan University of Technology. Funny and interesting in the context of climbing stairs. If you are not headed uphill you are probably headed downhill. Ever heard that one? Life is a struggle. Always has been and always will be. Some struggle more than others. Where are you in this process? What part of life is going uphill and which is headed down?